Lake Success, NY, August 15, 2016 --(PR.com)-- Voicebrook announces the 400th site to acquire its VoiceOver® Pathology reporting solution. The Brooklyn Hospital Center (TBHC), a 464 bed community hospital that serves nearly 300,000 patient visits annually, will go live in the Fall of 2016. The initiative will be led by Mary Beddoe, TBHC's Pathology and Laboratory Administrative Director. Ms. Beddoe is a Six Sigma Black Belt with a deep expertise in laboratory workflow. Before moving to TBHC, she had the unique opportunity of building a Pathology department from the ground up. At her previous job, she designed everything from the Pathology processes to the physical layout of the lab with an eye for eliminating unnecessary steps and reducing the time needed to get reports back to patients. VoiceOver was an integral part of this strategy, allowing for real time reporting without the need for transcriptionists. Templates, voice commands, and specialized input devices also significantly reduced non value-added steps that would otherwise be repeated several times throughout the day. When she started at TBHC, Ms. Beddoe immediately knew she wanted to bring in VoiceOver. "The lean principles evident in Voicebrook's product made it an easy choice," she said. Before VoiceOver, the Pathology department at TBHC relied on a combination of typing, hand written notations, and transcription. With Voicebrook's speech recognition based reporting solution, reports will be filled out as cases are being processed through the lab. It will no longer be necessary for clerks to waste time transcribing. Annotations and corrections can be made immediately with voice commands, and Pathologists can greatly reduce the time patients must wait for a diagnosis. Speed won't be the only benefit. "Besides realized process improvements," said Ms. Beddoe, "quality will be enhanced. When case findings are reviewed in real time versus waiting for transcription, the potential for error is reduced." "The Brooklyn Hospital Center's Pathology department continues to grow in the number of cases year to year," she added. "With the Voicebrook product, the department can better manage growth in a cost effective manner and provide a higher level of quality to the patients and physicians we serve." About Voicebrook: Voicebrook is only provider of speech recognition and reporting solutions tailored specifically to Pathology. VoiceOver® software is the most widely used and successful speech recognition solution available in the Pathology market. VoiceOver integrates directly with all major AP systems and expands upon core Dragon® Medical functionality to ensure the highest levels of success with speech recognition in a laboratory environment, empowering Pathologists to save time, money and lives. 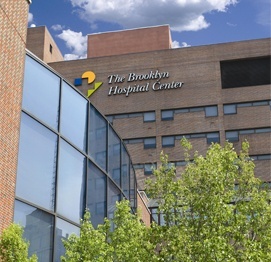 About The Brooklyn hospital Center: Founded as the borough’s first voluntary hospital, The Brooklyn Hospital Center has been keeping Brooklyn healthy since 1845. Today, it is a 464-bed community teaching hospital, and provides a full range of primary, specialty, diagnostic and tertiary care with a team of outstanding physicians, nurses and staff. TBHC services almost 300,000 annual patient visits throughout Brooklyn. Located in the heart of Downtown Brooklyn, TBHC is a clinical affiliate of The Mount Sinai Hospital and an academic affiliate of The Icahn School of Medicine at Mount Sinai. TBHC has fully accredited, independent residency programs in emergency medicine, internal medicine, general surgery, obstetrics and gynecology, pediatrics, pharmacy, family medicine, general dentistry and oral and maxillofacial surgery. TBHC trains more than 250 physicians each year.